It’s such an exciting time to be involved in design in South Africa. This year Cape Town holds the title of World Design Capital 2014,(#applause!) and kicking off the year setting the global design standard was the Design Inbada held last weekend. StylEast was of course there to make sure we could bring you all the news and reviews, first hand! 1. Its Halloween all year round! Once relegated to heavy metal fans and bikers, the skull motif truly made an appearance in interior design and decor at the Indaba! The macabre motif has run riot in fashion over the last few years ever since Alexander McQueen made it cool, and no surprise here, we have now seen a move into the world of interiors. Certainly, this trend is not for the faint of heart! But while it may be a bit ghoulish and dark, it certainly is interesting and adds an unexpected twist in an interior and conversation point! There were boundary-breaking hanging ‘skull’ planters at Sobeit. Pink metallic skulls for a pop princess, Blue skulls, red skulls, gold skulls, bronze skulls, monkey skulls…..! Ceramic Factory wasn’t far behind with their portrayal of skulls turned into interesting crockery. ”Skull Biltong plate” anyone? 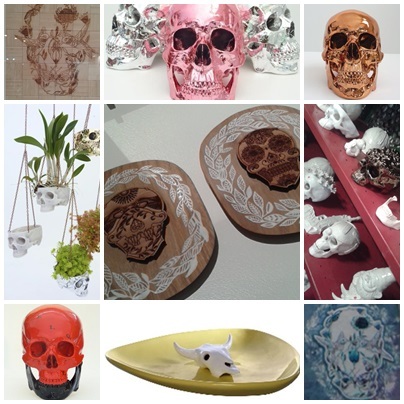 It need not all be Morticia Adams-esque tho, we came across some really beautiful drawings of skulls with definite Mexican roots, as well as a whimsical etching in timber of birds and insects that on closer inspection formed a skull motif. What is fascinating about this ‘trend’ is that it has been going strong in the UK for the last 5 years! It is going to be very interesting if this fad has lasting legs in SA or if the morbid subject matter is too much for our market to bear! skulls in all shapes and forms! Lasercutting is a process that we have seen developing over the last year or so, but it has certainly gained momentum and was showcased in many forms and applications at the Indaba. 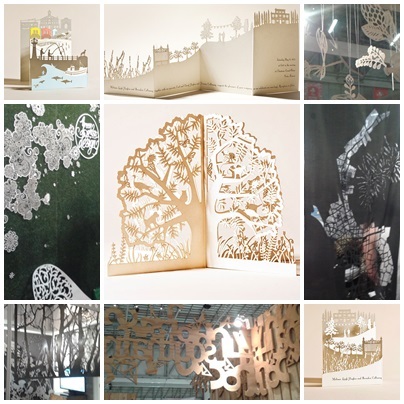 Whether it’s the appeal of what’s left or what’s missing, laser cut pieces blend art and technology in a trend that has permeated fashion, home, jewellery and stationary design . Advances in technology have allowed such intricate laser cutting to all sorts of materials – paper, metal, timber, perspex, fabric – and the final product is really most effective. The Arty Miss stand was an ode to lasercutting and showcased the technique most beautifully by creating unique extraordinary paper artwork. Another interesting stand was Wit op Wit with their “city-in-a-box” concept. They also had street maps lasercut onto fabrics, creating gorgeous patterns and shadows. It seems that the only limitation with this method is ones imagination! 3. (Still) Mad about Metallics! We have drummed on about our obsession with copper, brass and gold ad nausuem last year, as was the trend featured extensively in design magazines. At the risk of sounding like a tape stuck on repeat, we are very happy to report that Metallics, especially the warm ones, are still very h-o-t! Especially so when it comes to lighting. 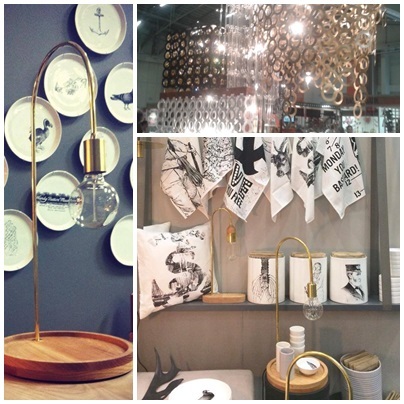 Our favourites showcased at the Indaba have to be the light fittings designed by one of our favourite South African design studios Egg Design, as well as the innovative and unique table lamps designed by Studio Number 19 and industrial pendant fittings from Hoy Ploy. L-O-V-E! Beautiful light fittings in warm metallics! Shine on! Bright colours, rich patterns, bold shapes and silhouettes were evident throughout the Indaba exhibition. 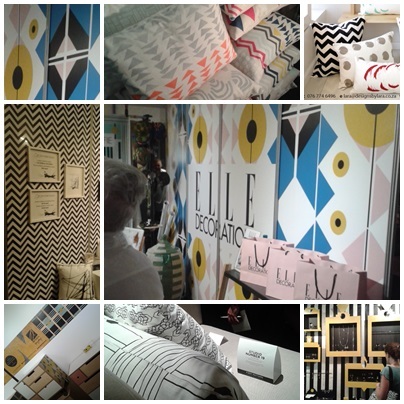 Prints were everywhere starting from a Retro-African inspired wallpaper at the Elle Deco stand, to geometric patterns adorning cushions and furniture. An absolute favourite of ours were the geometric monochromatic cushions by Studio Number 19. The key to making this visually loud trend work is by mixing it with subdued shades. Studio Number 19 did that so stylishly and in such a contemporary way that here at StylEast they were our Gold Star Winner of the Expo. The Design Indaba 2014 was full of talented creative’s sharing their ideas and the excited energy filling the hall was electric. Not only was it a showcase for the design/decor world but stationary, jewellery and fashion. And there were shoes!! Enough said!